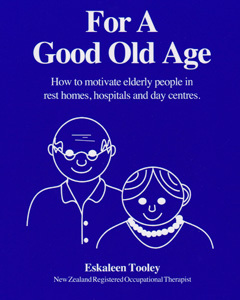 Eskaleen Tooley is a New Zealand registered occupational therapist who is passionate about improving the quality of older people's lives, especially those in care. This is borne out of three decades of working with elderly and disabled people in Christchurch and Auckland, in public/private hospitals and rest homes. 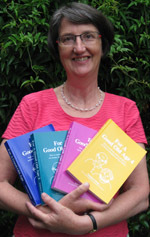 As a result, she has written and published four books about motivating older people living in care. Eskaleen is currently focusing on helping keep older people in their own homes by putting in services such as personal care, home help and shopping. Her latest venture is sewing colourful nylon activity parachutes and floor games for sale. The 360 pages in each For A Good Old Age book are packed with activity themes to go all year round and are linked together with cross references. Having a familiar format in each book makes it easy to navigate; having step-by-step instructions makes it easy to follow. Practical activity resource manuals written for New Zealand with an international flavour. Packed with quizzes, discussions, floor games, reminiscence and reality-oriented activities plus much more. Includes activities suitable for one-handed people, visually impaired and confused elderly people. Ideas that work gathered from the experience of Eskaleen Tooley, New Zealand registered occupational therapist and others. Each book is cross referenced to the others, broadening the scope and choice for the therapist. The For A Good Old Age A5-sized paperbacks clearly demonstrate the 'how, why and what' of therapeutic activities. For A Good Old Age details how to set up an activity programme and how to make your own resources. It contains over 30 activity themes and 20 non-calendar themes, illustrated by over 50 diagrams. "May I congratulate you on an excellent book. 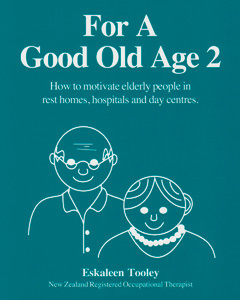 It is absolutely packed with ideas that would be a reassuring companion for professionals working in elderly care." $50 each + postage and packaging. 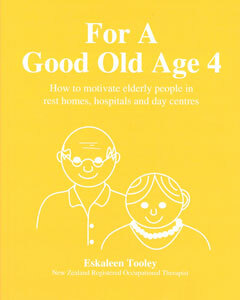 For A Good Old Age 2 details how to activate older people and has over 100 general activities. It contains over 18 more activity themes and 25 non-calendar themes, illustrated by over 70 diagrams. There is a special section on mini themes for confused elderly persons and activities for frail elderly persons. 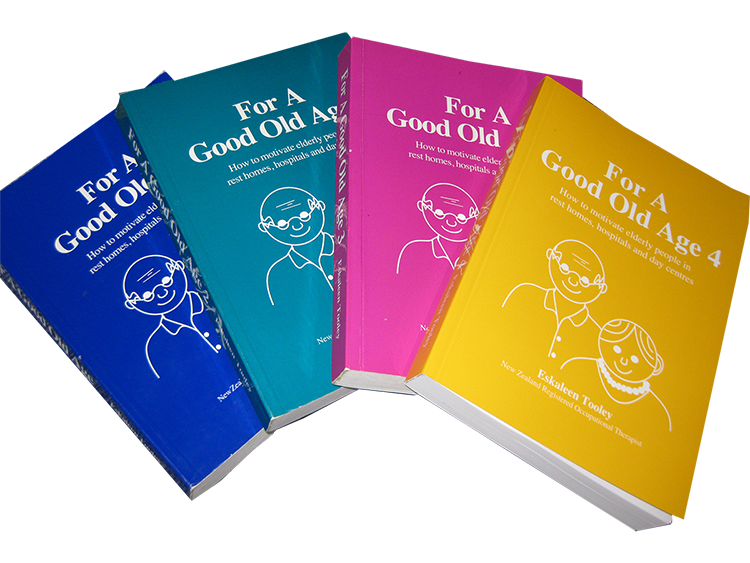 "[This] valuable manual should have a place in all areas where occupational and diversional therapists are aiming to improve older person's quality of life…For A Good Old Age 2 complements and broadens the scope of For A Good Old Age." 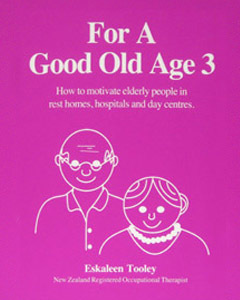 For A Good Old Age 3 details how to understand older people, make activity programmes easy and how to make more resources. It contains 50 new activity themes which are illustrated by over 50 diagrams. There is a special section on activities for visually impaired, one-handed and confused elderly people. "I have recently begun doing some work as an activity coordinator and discovered your books. They are providing me and my new elderly friends with much delight, interest, fun and laughter." For A Good Old Age 4 details how to generate a journey through the senses, understand the spiritual needs of the older person and how to make more resources. It contains over 50 new activity themes which are illustrated by over 30 diagrams. There is a special section for community groups. "The books are great! Myself and my co-workers are very excited to have these additional resources, bursting with creative ideas."